Why is Glide the best? Its tension is consistent through each and every spool. That means high quality stitch formations, less thread breaks and fewer machine stops. Also, Glide is virtually lint-free! Glide is a perfect match for all your domestic, longarm and embroidery machines. No matter if you have a Janome, Husqvarna, Bernina, Brother or more, Glide works perfectly with the majority of machines. It has special technology that really captures and locks in all the beautiful colours right into the polyester fiber. Its luster is second to none. All the colours of the rainbow each month. 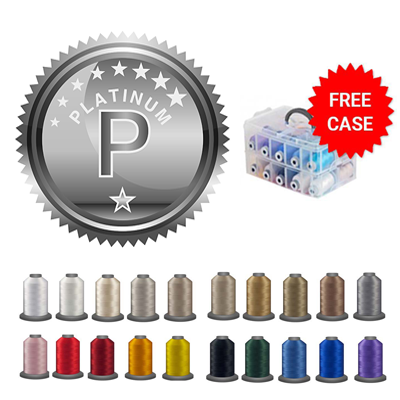 With over 240 amazing colours, you will get up to 20 of the best 40wt 1000m polyester spools each month, delivered right to your door. 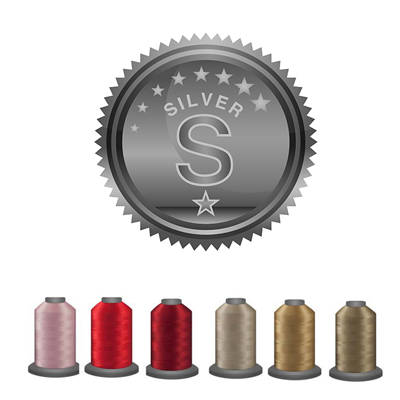 Never run out of thread again, and discover your "new" favourite colours! Save big when you subscribe to our Glide plans, and skip trips to the store. More time to quilt and sew! Next club shipment on May 15th. Don't miss out! I have a Husqvarna Viking mid-arm sit down quilting machine and have tried all different kinds of threads. I have decided my favorite is the Glide thread. The extra joy is it’s availability in the King spools. I’m so happy to find a Canadian online store at reasonable prices. As I need/want more colors I will order from Dinkydoo for sure. I placed the order and it arrived in less than a week. Yay for quick service. I love this thread and will definitely order more in the future. Thank you! Basic colours. Great thread, doesn't seem to twist or shed. I am using it for piecing right now. I bought Glide thread Volume one. I love the way each cone has an ability to lock the thread into place.My Brother innovis machine likes working with it there has been no problem. I love Glide thread for embroidery and for Free Motion quilting. It has a beautiful sheen and handles well in my machines. Thank you for being a Canadian supplier for this great thread. I love my new Glide Thread and storage box. The thread colours are gorgeous, and are colours that I'll definitely use. The modular storage box is perfect for thread, with room for a matching bobbin! I love that I can read the thread label through the box. No more digging for the colour I want. Q: What size is the thread? What type? A: The Glide thread in our club is 40wt. 1000m premium trilobal polyester, and is manufactured in the U.S.A.
A: You will simply not be charged on your 13th month. We will send your thread out on us. Easy! A: Yes, you will pay up front for your first shipment, and on the 1st day of each month following, unless you cancel your membership. Q: Do I get a FREE Glide Colour card with any club plan? A: Yes! 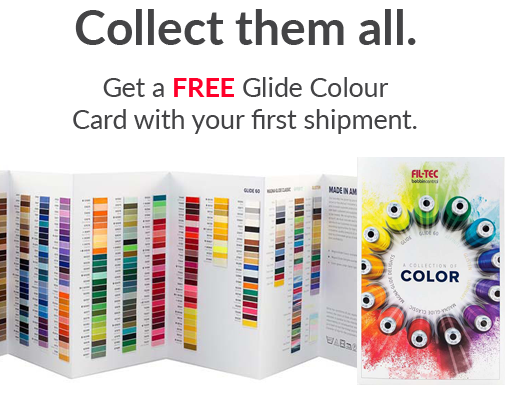 We will send you one Glide Colour card to track your collection easily and fill in missing colours. Please note, we will only send one card per customer. If you cancel your subscription and re-subscribe, you will not be sent a new card. Q: When will my thread be sent out? 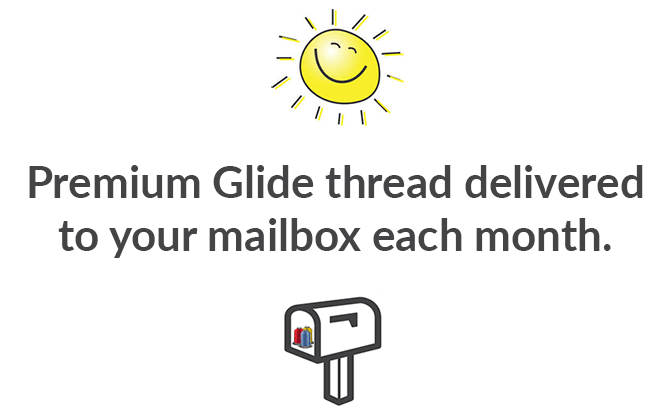 A: Glide thread is sent out on the 15th of each month. Q: Will I get duplicate colours each month? A: No. You will receive a brand new colour each month so you can eventually have all the Glide colours on hand. Q: If I don't like my thread, can I return it? A: Yes. We want you to be happy with the thread you get. The thread must be unwrapped and in sellable condition, and you must pay return shipping back to us, or bring it in-store for a full refund. Q: I don't like surprises. Can I choose which thread is sent? A: Unfortunately, no. Part of the fun of a thread club is the element of surprise on what we pick and what will be sent. 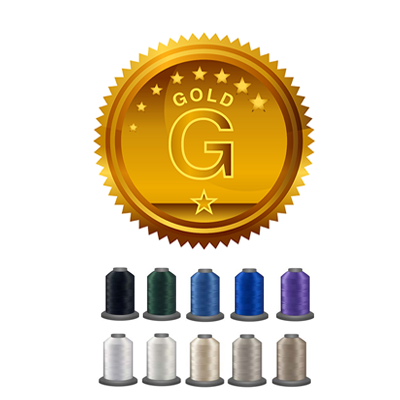 If surprises aren't for you, you can browse our in-stock Glide thread, and order your favourites! Q: If I cancel my membership and rejoin later, do the months I received earlier count towards my FREE 13th month shipment?